In a similar manner to how core contributors are listed on release posts, we want to thank translators for their effort on ja.wordpress.org blog post. Translators who helped WordPress core are shown on the About > Credit page, but there are people who help translate other projects. It would be nice to have a full list of contributors across all translate.wordpress.org projects during the previous release cycle. Other projects are not really tied to WordPress release cycles, but we could probably add the ability to generate a list of contributors whose translations were approved between two particular dates (start and end of the cycle). we could probably add the ability to generate a list of contributors whose translations were approved between two particular dates (start and end of the cycle). Yes, that was what I expected. Thanks for the clarification. The output could be on translate.wordpress.com or the dashboard of the Rosetta site. This is just something nice to have, so I'd like to see it if it's not super complicated to achieve. Headers for each release cycle, with dates underneath. e.g. 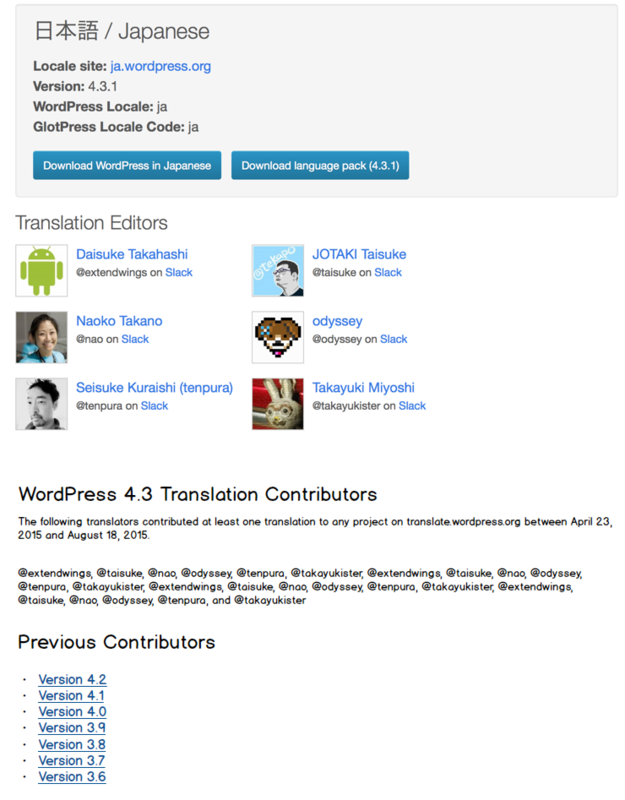 "WordPress 4.3" as the header and, underneath, "The following translators contributed at least one translation to any project on translate.wordpress.org between April 23, 2015 and August 18, 2015." Curious to know if that the last item would be helpful. It would make it harder to copy/paste, but maybe we could write a shortcode to import the list of translators per locale, so on ja.wordpress.org, you could just add [contributors release="4.3"] and it would output the list. There is a public translation contributor page for each locale (e.g. ​https://make.wordpress.org/polyglots/teams/?locale=ja), so I was thinking of this. The page is linked from ​https://make.wordpress.org/polyglots/ navigation menu, but it's a bit hard to find. We can give more thoughts about the best location / URL for the page. I think so! But for the initial stage, it can be a simple list -- core contributor list doesn't list numbers of props. Better to move previous contribution info to linked pages. This requires yet another pages, but it helps declutter the page. Translation Editors may be too prominent, compared to others who are referred by the username only. This would be helpful to have in other projects as well (themes and plugins). When we finish a translation of a big project like WooCommerce, we would like to thank all the contributors. #1879 was marked as a duplicate.